The most important thing you need to know to make long-term progress on your fitness goals is a concept called 'Training Age.' Your training age isn't your actual age. It's more to do with how developed you are as an athlete, and it affects rate of progress, the kind of program you need, what kind of coaching you'll benefit from, and much, much more. If you don't understand how your training age is affecting your progress in sport or at the gym, you're likely to spend years spinning your wheels and getting nowhere. I've created a simple chart to summarise the key things you need to know about your training age, which I've then explained in more detail blow. I hope you find it useful! Understanding your training age helps you understand what type of program you should be on and what kind of coaching you'd benefit from. Beginners fall prey to two traps here. First, they can get away with bad technique in the short term and still make good progress. Because of this, they don't have as strong an incentive to perfect each exercise. Second, beginners learn from early experience to expect constant improvement. In the medium to long-run, this is totally unrealistic (actually, impossible), and that's a reality that makes the mental shift from beginner to intermediate very difficult. More advanced trainees need to pay increasing attention to things outside the gym in order to see continued progress. 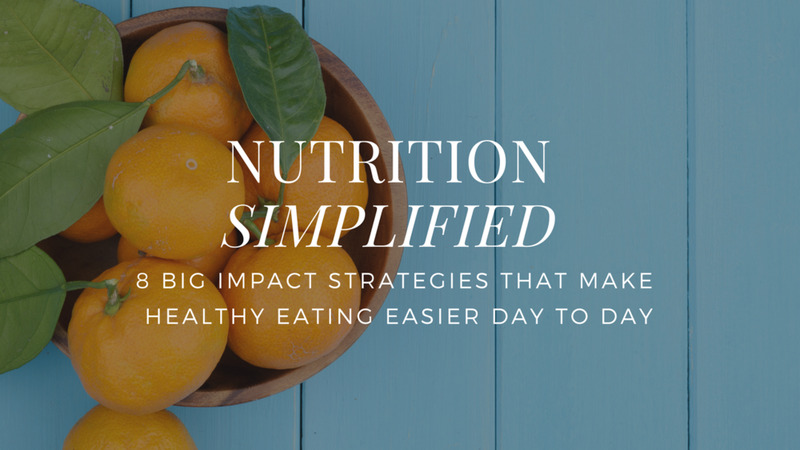 That means prioritising training over other important aspects of their lives, having effective nutrition habits, getting enough sleep, practicing various recovery techniques, etc... if they want to continue to see improvements in their body composition, strength, and fitness levels. Rate of Progress: It's fast. You'll get a bit better, meaning being able to do a bit more weight, an extra rep or two, or to go a little faster, anywhere from workout to workout, to every 1-2 weeks. iii) some remedial/weak link training to improve structural balance. By structural balance, I mean this: ensuring that the strength of your various muscle groups are a) sufficient to support your training without undue risk of injury, and b) that they are balanced - one muscle group doesn't over-power the rest, leading to less effective results or higher risk of injury. For a common example of a structural balance problem, check out this post on weak glutes. Importance of Technique to Progress: For short term progress (for about a few months), technique isn’t actually all that important for beginners. They can see general performance improvement with poor technique. But assuming the trainee wants to make long-term progress and minimise the risk of injury, it’s best to lay the foundation of near-perfect technique in the beginner phase. At the intermediate stage and beyond, poor technique will be a massive limiter to progress, and fixing bad technique can require taking a giant step backward for many months. That's not a fun process and it's best to avoid it! Since there are very very few cases when people have a real, firm, short-term deadline for fitness improvement, it's virtually never worth it to relax your approach on perfect technique. Type of Coaching Needed: Beginners benefit from plenty of coaching, especially one-to-one coaching. This is the best way to learn and constantly reinforce good technique. Ideally, the coach can also design an effective program for them that addresses their structural balance needs/i.e. fixes any weak spots or 'red-flag' areas for predictable injuries down the road based on their limitations. Just about everyone starts out with a few areas that need extra attention, so this is just part of the process. A thorough assessment at the beginning of your training program should identify which areas need extra work. Biggest Problems: Lack of patience for technical development and/or inconsistency. Some people want to rush into smashing heavy weights on day one. That energy and motivation is a plus, but at the same time you've got to be patient to learn the right way. If you don't learn the right way the first time, you'll end up being frustrated later at your lack of progress. You'll also probably end up injured in the medium-to-long term. The other problem is being unrealistic about how much time you have to devote to training. Sometime people will start a 5 or 6 day a week program, but when life gets busy, they'll be unable to complete the full program and stop all together. Consistency trumps everything, so pick something you can stick with. Key to Progress: Consistency and willingness to learn. Risk/reward to make progress: Because the load that beginners use is relatively low, any risk of injury is also quite low, even if technique isn't perfect. It's pretty easy to spend a few months of solid training and maximize your 'newbie gains', and then simply maintain that with minimal effort on an ongoing basis. The benefits of progressing through the beginner phase are very high (in terms of performance improvement), and the time investment is fairly small. For example, it's not uncommon for males to add 100lbs + to their deadlift in the first months of training, and for females 50-75lbs +. Why not take that low hanging fruit? 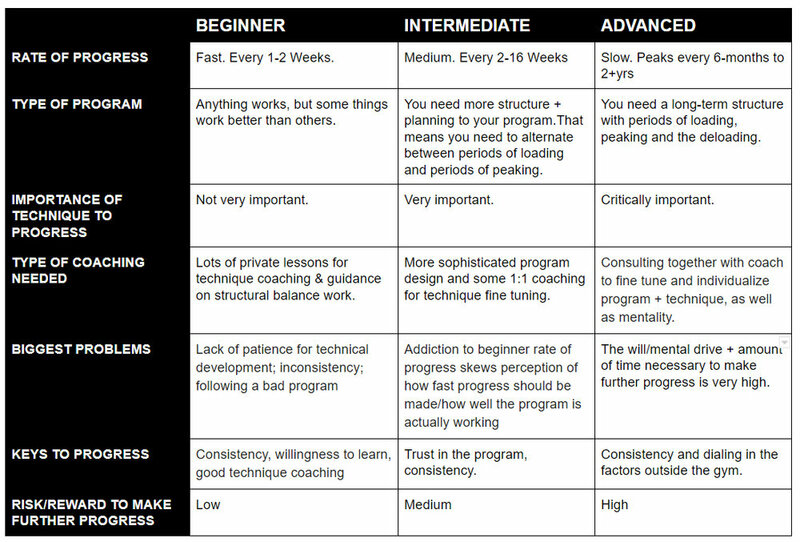 Type of Program: To make progress in your intermediate training age you need more structure to your program, also called planning or periodisation. That means you need to alternate between periods of loading and periods of peaking. Ideally, your program should start to become more individualised and more attuned to your ‘essence’ as an athlete in this phase. Importance of Technique to Progress: Technique starts to become very significant at this point. Ineffective technique will limit you more and more as you push your boundaries. Even if you're strong enough to lift 400lbs, if you're only using "300lbs" technique, you won't be able to get close to your potential. The same is true with speed and endurance. If you're a runner with sloppy mechanics, it's going to be harder to get better at this level. You've got to look at technique. Type of Coaching Needed: By this time the athlete should have the technique basics down and some training experience. While just about any program will yield some results as a beginner, intermediates need help with a more sophisticated program to keep them progressing. They also need help with technique check-ins/fine-tuning which can be accomplished effectively in private coaching sessions or in small group training. Biggest Problems: The biggest problem I see with the intermediate training age is unrealistic expectations. It's almost impossible not to get addicted to wildly fast rate of progress that beginners experience. In this early phase you constantly hit new personal bests nearly every week. As you transition into your intermediate status, you have a skewed perception of how fast you "should" be progressing. You want the rush of achieving personal bests all the time, but the reality has changed. It will take more time and more work to see a result. This leads many intermediates to think that their program isn't working well and to potentially give-up or to jump around and constantly try different programs or coaches. The reality is just that those quick improvements are gone forever, and now you've got to dig in and expect to work a lot harder for much more modest rates of growth. Key to Progress: Trust in the program. Risk/reward to make progress: As an intermediate, now you're starting to handle some heavier weights. That means you need to be more attuned to technique breakdowns and over training. To keep making progress, the risk of injury is a bit higher because of this. Rate of Progress: Slow (Peaks every 6mo to 2yr+). Think of an Olympian who trains for 4 years to beat their personal best by 2kg or a tenth (or hundredth?) of a second. Type of Program: You need a long-term structure with periods of loading, peaking and the deloading. It will be increasingly beneficial to insert small periods of lower loading between training phases (1-4 weeks) and a dedicated off-season to allow the body to recuperate and work on weak areas. Importance of Technique to Progress: It's absolutely critical, no matter what your sport or training goal. Here's an article about lifting and the important of technique by on of the best lifters of all time, Dan Green. Type of Coaching Needed: At this point the lifter has a lot of experience and knows their body. It's about consulting together between coach and athlete to create the right relationships, fine tune program, perfect technique, and work on developing an effective mindset. Biggest Problems: There's a lot that goes into training at this level. The biggest challenge is balancing training and recovery with the rest of your live. The athlete's will/mental drive needs to be high, and they need significant time and resources to support training and competition. Key to Progress: At this stage the things happening outside the gym are almost as important as the training program itself. Do you have the lifestyle to support your training goals? Are you eating properly? Are you sleeping enough? Are you able to prioritize training above most other things in your life? This is a great article about the British cycling coach in 2010 and how focusing on improving things outside the gym led to improvements. Risk/reward to make progress: Higher. To get better when you're already advanced means lots of hard training. That's not easy on the body. If you talk to most people who perform (or performed) at the highest level, there's a physical cost to that which can be short or long term. Advanced athletes ride a razor's edge. If they find the right balance, they improve and perform well. If something unravels, they fall off. It's not uncommon for a setback like an injury, a more demanding life schedule, or just a less effective training cycle lead to a 'lost year' where no progress was made. You could be advanced in one area of fitness (let's say an endurance athlete) but a beginner in another area (strength training) if you've never trained it before. This is all dependent on the fitness trait you're trying to develop. I've divided training age into three categories for simplicity: beginner, intermediate and advanced. In reality these blend together as you move along the curve. To introduce this idea and to help you visualize it, I did this video on training age.